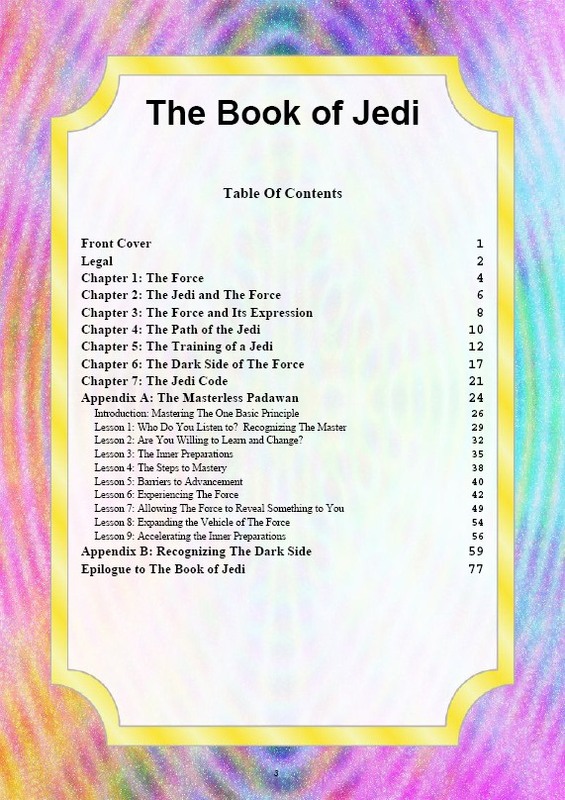 The Book of Jedi is a free publication that prepares the Initiate for training in a Jedi Academy. It has been imbued with specific thought seeds and a secret internal rhythm that will awaken an awareness of The Force within you. Simply by reading through this document in it’s entirety, certain inner preparations will be made within you. The Jedi Order has existed quietly on Earth for centuries, awaiting for this moment in history to come forward and make our training available to many more who qualify to learn the ways of The Force. In the final pages, instructions will be given to you should you choose to request additional information about formal training in one of our academies. The Book of Jedi may only be acquired by those who have been invited to read it by a member of the Jedi Network. If you have been so invited to read The Book of Jedi, please enter your invitation code below or use a link that provides a code for you. What are people saying about The Book of Jedi ? Words cannot describe how i felt about The Book of Jedi. It awakened something from within me. I felt something…amazing. I finally feel like there is something out there for me. I would really, really appreciate it if someone were to contact me. I’m interested about the audio training that the book had mentioned that was available. Please Please contact me as soon as possible. Thank you so much, Dogen! You are an amazing BEing. … I just read the book of Jedi, and I must say that you did an amazing job. I was just going to read a couple of pages and then come back to it later, but I ended up reading the whole thing immediately after downloading, I loved it, and am looking forward to reading it again. I appreciate everything you have done for me, even if I don’t know consciously what ‘everything’ is. I really would appreciate meeting you, feel free to contact me anytime you want. You are amazing and The Book of Jedi is extraordinary and so reflective of your beautiful energy….